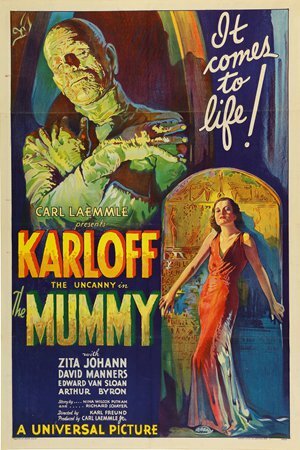 A rare, original poster from the Boris Karloff horror classic The Mummy that was predicted to set a record price for a film poster at auction went unsold on Wednesday when no one bid the $950,000 minimum in the online sale. Sotheby's had predicted that the work, one of only three known surviving examples of the original lithographic poster from the 1932 film, would fetch up to $1.5 million. "Unfortunately, the work did not find a buyer in our online auction that concluded today, but that does not in any way detract from its importance," Sotheby's said in a statement. The auction house described the piece as "one of the rarest and most celebrated film posters in existence, and a seminal example of the graphic design pioneered by Hollywood studios during their 'Golden Age of Horror.'" The poster set a record more than 20 years ago when it fetched $453,500, a price exceeded last year when a poster from Dracula, the 1931 horror film starring Karloff rival Bela Lugosi, sold for $525,800 at auction.